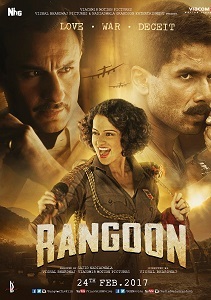 Review Summary: Vishal Bharadwaj uses more linear storytelling for Rangoon in a beautifully mounted canvas with a strong turn by Kangana. I’m going with two and a half out of five. There are reluctant bodyguards, sacrificing soldiers, national anthem being sung, atrocities on common folk, and a bridge on the river Kwai that should have been blown up by at least one warring side. The movie is so long you are too tired to call it names when it is over. Strong performances by Kangana, Shahid and Saif Ali Khan create 'bloody hell' saga! It appears the filmmakers were keen to make a film on India during World War 2, because, to the best of my knowledge, no one has. Julia, the heroine at the centre, is a minor McGuffin at best. Rangoon is not Vishal Bhardwaj's best directorial venture, but it deserves a one-time watch. An emotionally appealing love story set at the backdrop of second world war and Indian Freedom Movement. Had the film been snappier, shorter, it would have been more impactful. If you dig Vishal Bhardwaj’s brand of cinema, a one-time watch wouldn’t hurt much. Story-telling gets a li’l bumpy, but the performances are to watch for! On the whole, RANGOON is an epic love saga with strong emotional quotient, riveting second hour and nail-biting finale. Watch it for its layered plot, serpentine twists, proficient storytelling and bravura performances. A content-driven film that’s worth a recommendation! Although ‘Rangoon’ is unable to measure up to the director’s other masterpieces like ‘Haider’, ‘Omkara’ or ‘Maqbool’, the film has the quality to keep the audience hooked. Rusi is married, but is also in an extra-marital relationship with Julia. It may be one of the most awaited films in recent times but Rangoon is a royal misfire. Rangoon is definitely not avoidable but it is certainly not a Vishal Bhardwaj masterpiece. Watching Rangoon is just like reading a book. You connect with the story so completely that it virtually becomes a part of you. Watch ‘Rangoon’ if you must – it definitely has visual appeal. The Shahid-Kangana-Saif starrer is sprinkled with magical moments, worthy of watching once!